disappeared for about two weeks. When I could finally pull my head out of the rabbit hole, I found everything in the yard was in bloom. 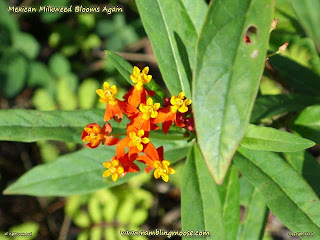 Mexican Milkweed was followed by Hibiscus, Bougainvillea, six different types of Orchids, and many other oddball plants. My "farm" in the backyard was taking well, I could make a really bizarre salad out of a carrot and some green onions, because they were even growing. Toss in some bamboo shoots for good measure, and it could be an Asian Salad. Yeah, that much. I'm in the middle of a Propagation Binge here. All my plant pots are stuffed with all sorts of things waiting to root and be put into the ground. Why not, we're here, we're going to stay for a while, may as well make it look good. Summer is coming and therefore the Wet Season so everything will get a good start once in the ground. That first day, I explored the yard and saw that my Mexican Milkweed also had a ripening seed head. I'll toss some seeds in the garden, and go back to tossing them all over the area. Sometimes they grow, sometimes not. Fast forward a few days. My respite from having things eaten had ended and I didn't realize it yet. I was inspecting my cuttings. 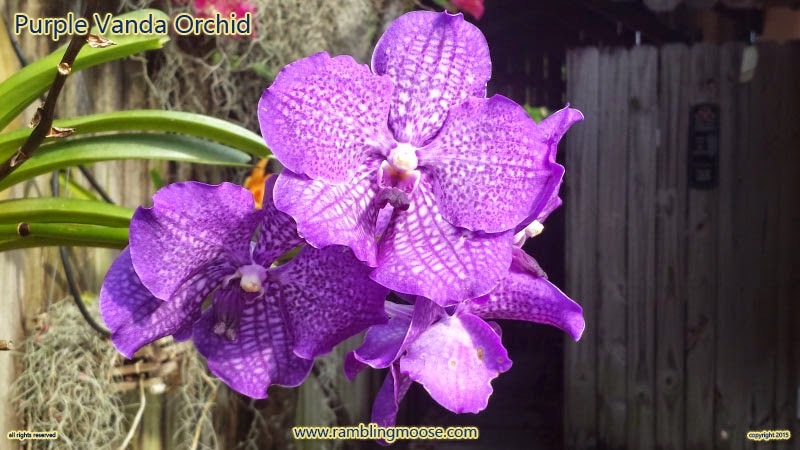 The easiest way to get things to root is to use rooting hormone. Then you stick the cutting in a pot, and keep that pot wet until you see growth. I was seeing growth, but everything was so wet that the cuttings were leaning over. My Bamboo cuttings especially, leaning to one side because that pot was more like a mud bog and the consistency of pudding. Working my way down the chain of plant pots that are on the low flow irrigation, I noticed Banana was beautiful, Podocarpus was perky, and even the Milkweed was looking marvelous. Well, not quite marvelous. It had been discovered. At some point during the last week, the Monarchs had started showing back in the neighborhood. 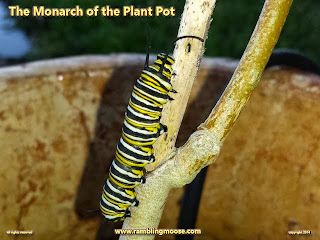 This far south in South Florida, we have "indigenous" Monarchs. They live here all year around. I like to watch them, and watch them I did from my bouncy Poang Chair sitting in the front window of the house. They'd float by on the breezes, and I'd cough at them while healing slowly from the Flu. There were also the ones that were black and yellow striped Swallowtail butterflies that would dazzle the eyes as they'd flutter past looking for my orange tree to lay eggs to make caterpillars that look like bird crap and have little red antennas. I tend to flick them off my orange tree. That tree isn't doing that well, and losing leaves doesn't help. the matter of the seed pod. I started pulling on it. Not exactly the right thing to do at that point. I did get the pod off the plant but the two caterpillars that were battling for supremacy got flung off. Their black and yellow striped minds had to be thinking that the world had gone mad, or they were on a weird twisted carnival ride. I rescued them with a Sea Grape leaf the size and shape of a CD. 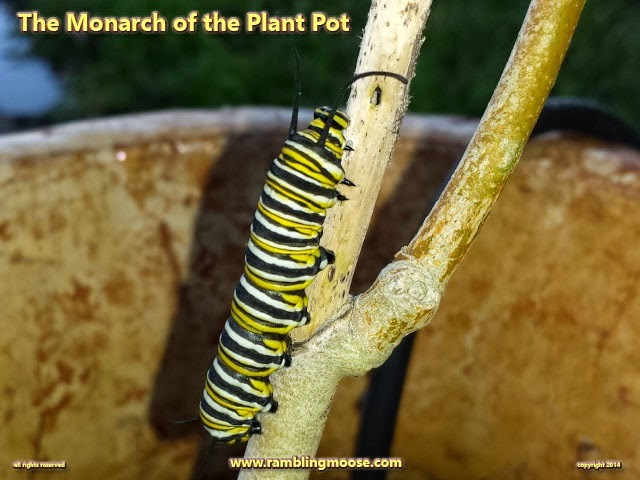 You have to put the leaf under them and allow them to climb onto it because a Monarch Caterpillar will attempt to hold tight when being pulled away from a plant. Then your natural reaction is to pull harder and you end up with a bifurcated butterfly that will never happen. I put the two Caterpillars back in the pot and went back to the house thinking that they may or may not survive unless they learn to eat the coleus that is in that pot. The pod ended up on a container in the kitchen for the next few days. Tending to making my breakfast that particular morning, I spotted a worm. Or at least at first glance I thought it was. I was going to turn it into worm smear when I got the bright idea to turn on the light. 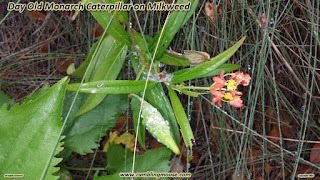 What I really had was a one day old Monarch Caterpillar the size of an Inchworm. I finished making coffee, turned the heat off and took the discarded Sweet n Low packet from the counter. I was going to relocate this little creature to the park near the house. It had climbed onto the pink paper and I took it out the door, down the block, and placed it onto the leaf of the Milkweed there at M.E. DePalma Park. Straightening up, I looked down and saw it was on another nameless plant next to it. Try again. This time it ended up on the ground. Try again. 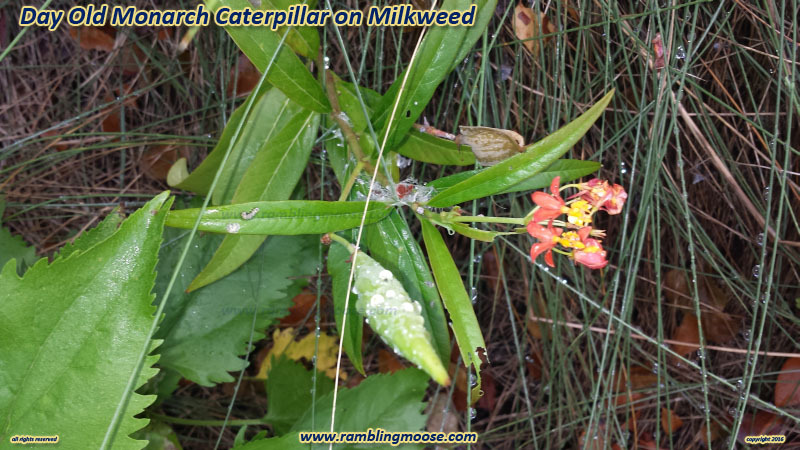 Third time the charm, it was on the little Milkweed, and on its way. Success! Two days later, when we walked Rack the McNab SuperDog (TM) past that plant I pointed it out to him and said "There, boy! That's the Monarch I saved". He looked up at me with his brown eyes, wagged his tail and went back to walking down to the yellow flowers to water them again. All is well, we saved a Monarch after flinging two, stranding another, and probably starving more. Need to stop growing Bamboo and start more Mexican Milkweed here!